Tom keep it up, solid gold here. One question on the oil wash, when applying over large area's on n scale how's the effect? I find that on n scale up close I've never been happy with my washes, (mostly uneven) but I'll admit I never used water soluble oils for this. It would depend on what the surface is that you're applying the wash to. The more even and less textured your airbrush work is, the better you can get an even wash. Funny, I have the opposite problem: acrylics dry too quickly for larger models. I use regular oils for portrait painting, and can get nice even glazes mixing them with linseed oil - but I haven't tried that on models. I'm not positive as to exactly why the lettering would behave like this as a result of the dynamic brake heat. I'm not sure it is charred lettering or discolored lettering. Either way, I use a fine tipped brush and some Liquitex Burnt Umber for the darker brown/red areas, and I gradually mix in Polly Scale Rust for the orange-ish areas. Again, substitute M. Graham Transparent Orange Iron Oxide if you've ran out of Polly Scale. A close up of the cab at this point. Using Liquitex Burnt Umber, I've used a small brush to paint a little rust at the base of the cab, and added some rust streaking from the battery boxes. I'll use acrylics and take advantage of the fast drying time if I need to work on a small area like this that might require multiple layers to get right. I'll also mix in a little 91% alcohol (so little it is almost vapor on the brush) to get some whitening and color changing to happen - like the area around the word "batteries". 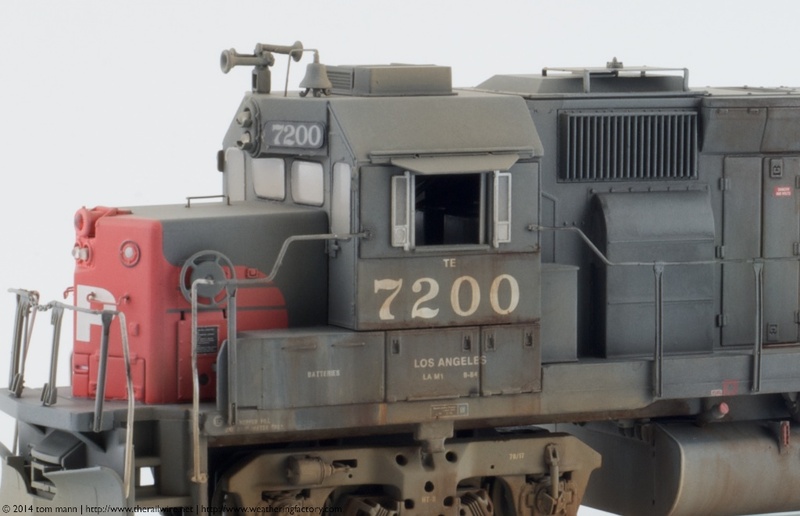 I also used a little bit of titanium white acrylic to create that smear around the "7" as seen on the actual locomotive photo. However, later, I'll get rid of this since it looked like an accident! The glass is cleaned with alcohol and tooth picks, not too thoroughly and leaving a little in the corners to look like dirt/dust. I'll give the short hood an oil paint wash, and gradually mix in more oil paint pigment to the wash to look like rusting on the top. A drop of alcohol spreads this nicely. 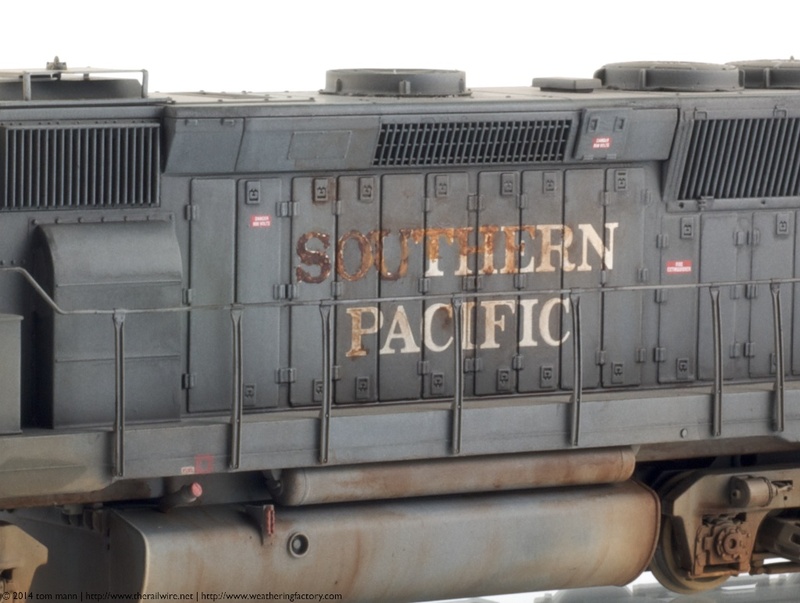 What color would you use for your initial airbrush "glaze" for an all-black unit such as Penn Central or Southern unit? If you want the lettering to be faded significantly, I would mix up a gray color (like Polly Scale Tarnished Black). Otherwise, the tan mixture that I spoke up in the "experiments with vallejo" thread. 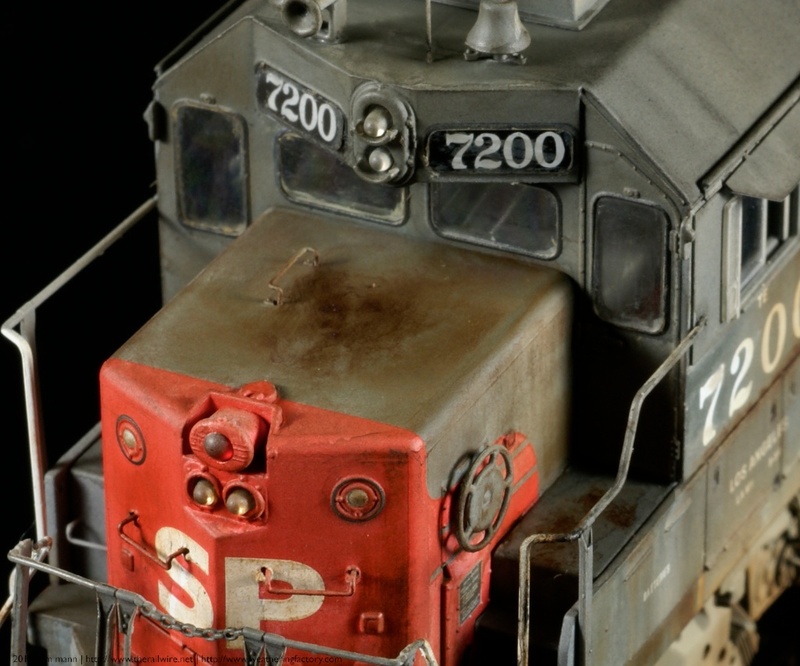 I'm about to start working on a HH660 in SP tiger stripe, so you'll be able to see my results. This is the last photo I took before the "final" images in the first post. The trucks looked a little too simplified, so I did a texturing trick. If you don't thoroughly mix the Burnt Umber oil paint in 91% alcohol, you get essentially suspended pigment in a fast-drying medium. You can brush this on, watch it dry extremely quickly thanks to the alcohol, and enjoy a nice rusty, shadowly texture appear almost "for free". I also did this around the dynamic brake, the frame, and the air tank. For the walkways, I used more Ivory Black in the mix. A final step was to add some Ivory Black to represent grease around the bearings. That's it. 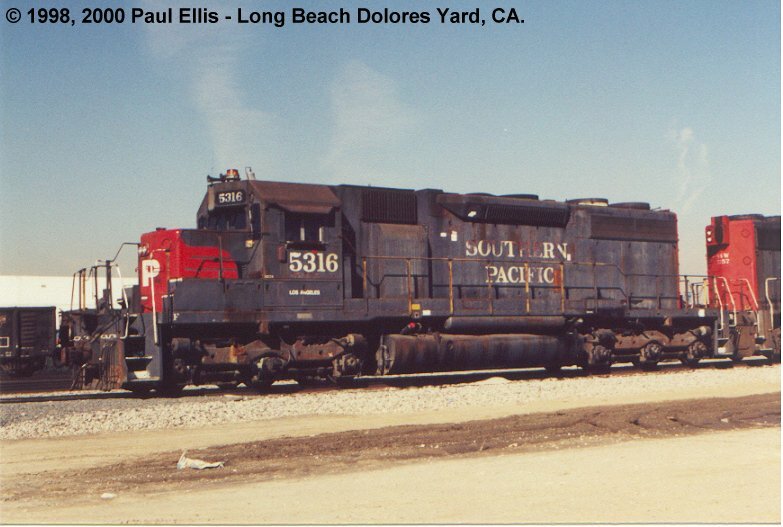 If you plan on handling your locomotive a lot, go ahead and Dull Cote it. Enjoy your model! Thanks. I recognize that a few photos can't possibly convey the entire process. It would be like watching a version of To Kill a Mockingbird and seeing the middle of the trial take an abrupt cut to Scout in the ham costume. Wait?! Something was left out here?!! You do such wonderful work but there is one thing that really bothers me and it has nothing to do with what you have done. It's an Athearn complaint that I have and it pertains to the lights. They are the most ugly things about their models. I mean look at the way they stick out like bullets!!! 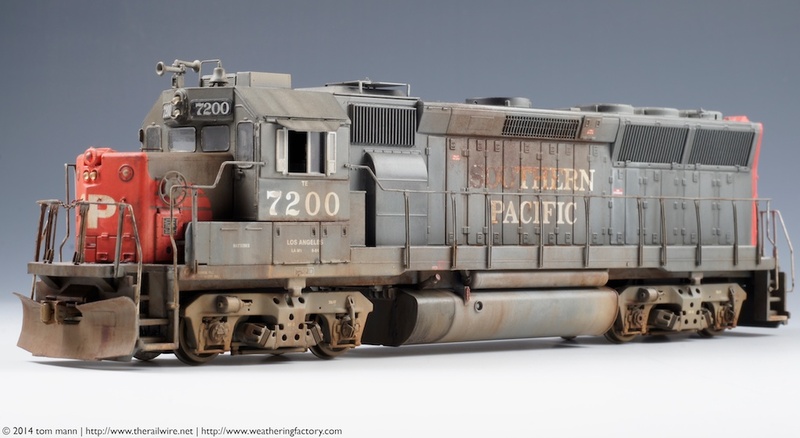 They make this nice model but are still stuck with 70's tooling on the lights. Why don't they retool these damn things! It really sticks out........literally. Well keep up the great work, that was just a rant I had to let out. Jon Stepping down from the soap box. Excellent tutorial! The tan fading technique is one I'm definitely adopting. Are you using a W&N tan wash for it? As for the 'burnt' lettering, it's not rust. The white paint is flaking off, revealing the red primer underneath. 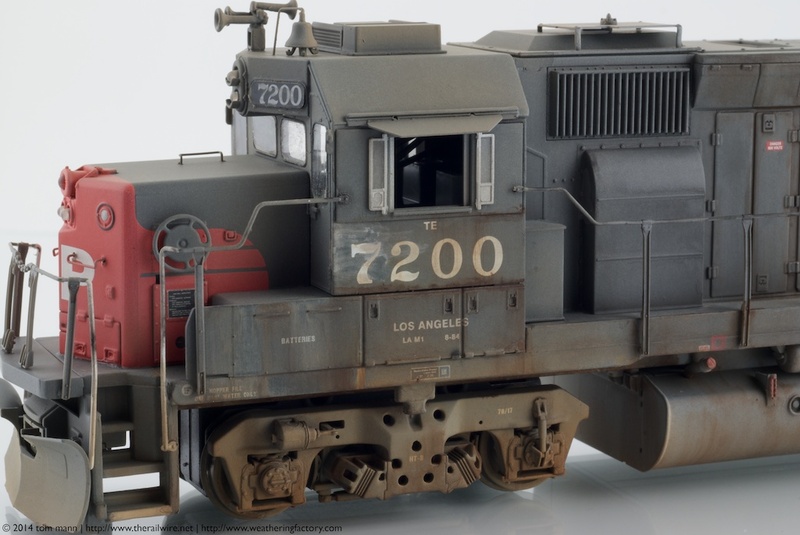 So, in future models, use a fine brush and stipple a dirty, faded red primer color in a paint chip technique vs just rusty letters. Also gently drybrush the letters with SP gray to make it look as if the lettering is fading away. Any chance the photos could be restored to this topic. I would nominate it for the best post of any category ever posted on the internet. Ever. I laughed so much at this comment before I realized it was mine!